CNY Centro #1000 at South Salina & Fayette Streets in downtown Syracuse. Photograph taken March 6, 2010 by Jim Devlin. Hi Jim Devlin, my name is Caesar and I'm a driver for RTS in Rochester. I would just like to say I think your bus pics are the best. 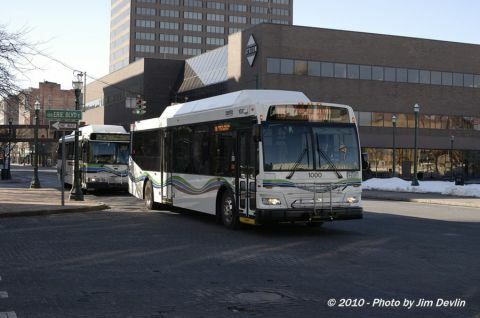 Also, I came across apic you took of a Gillig Phantom (505) you took at the corner of Main and Clinton in Rochester. I love that, because I'm the driver in it. Keep up the good work, and I'll have some of my pics up soon.